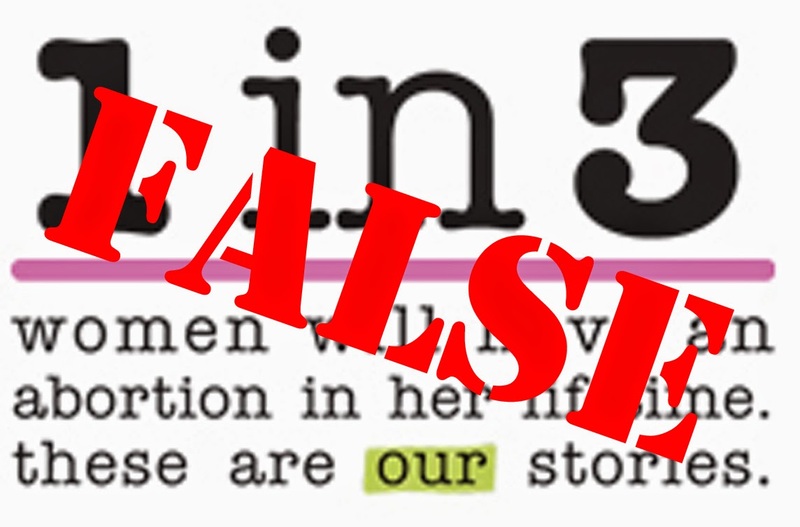 A reader emailed me asking if we could do a piece on the oft-touted statistic that "1 in 3 women will have an abortion in her lifetime" (or "by age 45"). Happy to oblige. By the way, suggestions for blog topics are always welcome. The pro-choice movement loves to use the 1-in-3 statistic, arguing that it "humanize[s] the issue." (The irony of that statement does not escape me.) Of course, from a pro-life perspective, it matters little how many people have had an abortion; we know from history that large masses of people are capable of being very, tragically wrong. The apparent message they're trying to get across—that every third woman you see on the street has killed at least one embryo or fetus and therefore it must be totally okay—is, let's face it, not a logical argument by any stretch of the imagination. But as the pro-life movement gains ground, I'm sure abortion supporters find it comforting that they have some strength in numbers. There's even a pro-choice book and campaign named after this statistic. The cumulative first-abortion rate increases with age, and women aged 40 and older had a rate of 300.9 per 1,000 women. Put differently, an estimated 30.1% of women aged 15–44 in 2008 will have an abortion by age 45 if exposed to prevailing abortion rates throughout their reproductive lives. First of all, just in case the entire pro-choice movement missed out on third-grade math, 300.9 per 1,000 is not "1 in 3." It's basically 3 in 10, which is one in three-and-a-third. Their statistic is short a third of a person. Considering the substantial changes in abortion rates observed among young women, African American women, and poor women, abortion rates were calculated to determine potential interactions among these groups. Because some of these subgroups are relatively small and because the confidence intervals suggest some degree of inaccuracy, these findings are best interpreted as general patterns as opposed to precise measures. Go tell that to the 1 in 3 campaign. At this point, there's just no feasible way that the lifetime abortion rate is even close to 1 in 3. We should celebrate that today's teenagers have much better things to look forward to than a one-in-three chance of being a party to an abortion. Interestingly, the Jones & Kavanaugh study points out that an earlier study (in 1992) had predicted that a whopping 42% of women would have an abortion by age 45. The overly-enthusiastic abortion projection is not a new phenomenon. 1. For commentary about this in the context of abortion business closures, see When Access and Choice Collide. It's hard to separate out how many closures can be attributed to the decline in business versus how many can be attributed to pro-life legislation. Great stuff thanks. The 1 in 3 gets used over here in the States all the time. I'm going to bookmark this for future use! Oh. I thought the 1 in 3 campaign was about one in three Americans getting arrested by the time they turn 23. Because that's totally normal too, and there's nothing wrong with getting arrested. Just out of interest, do you have a citation for this? I honestly had no idea that getting arrested was that common. I've been speculating about this issue for a long time in the comment sections of various blogs, so I'm glad to see that someone took a closer look at this matter. Great article! Exactly. It seems to me that a woman who has had an abortion is more likely to have another than a woman who has not had one. (No, I don't have any data for that.) We do know that there are women who have several abortions over a lifetime. That really skews the data. If I remember correctly, I think that I previously saw some data which states that about half of females who get abortions also previously had at least one abortion. I personally think that, until abortion can be made illegal, the cost of abortion should include a counselling session on birth control (including info on all forms of birth control, including abstinence and NFP and the failure rate of all forms) and must include the cost of 'giving' a reliable form of birth control (such as an implant) to the woman to reduce the odds of her being a repeat customer. If the woman doesn't want the birth control she doesn't have to take it, but she still has to pay for it.